During your placement, you will be placed at a local orphanage where you will be assisting with occupational tasks related to abandoned children. The orphanage welcomes children of all ages and keeps the ones with disabilities until the age of 40 if they have not been adopted. Many have been abandoned because of their disabilities. Others have been found abandoned in the street and were taken to the centre. The special needs centre within the orphanage can accommodate up to 50 patients at any given time. Their disabilities vary. They suffer from different physical or mental disabilities including down syndrome, autism, trisomies, quadriplegic, amongst others. The centre provides them with the right assistance they need through specialised social works and doctors depending on their disabilities. This internship is suitable for anyone interested in pursuing a career in occupational therapy. This can also be a good placement for someone wanting to help and contribute in a positive way to children having difficulties doing what others do due to their disabilities. You will be exposed to what it is like for the local therapists to operate in a developing country. This field is an emerging job market in the country. You will also learn about Moroccan’s culture and develop your professional network as well as your circle of friends. During your internship at the centre, you will be able to assist the local professionals in their daily activities as they help the children go through their days. This includes assisting showering them, taking them on walks, preparing their meals, feeding them, entertaining them with crafts or outdoor activities or other workshops. You will always be with a competent professional and will, therefore, have the opportunity to learn about the field and get first-hand experience in what it’s like to be a social worker in a developing country. No specific skills or experience are required. However, the intern should be positive, enthusiastic, patient and respectful. Interns are also asked to be prepared psychologically to work with children suffering various disabilities as it can be a very emotional placement. Your placement will be located in the administrative capital of Morocco. Rabat blends modern and traditional architectures in a very amortised way. 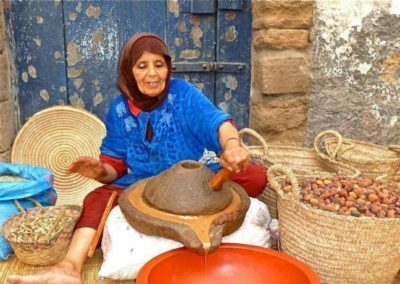 You will have the chance to discover Moroccan’s specialty foods, traditions, and artifacts including finest leathers, spices, and customized wooden doors with its Arabo-Muslim influences. Your accommodation will be in a renovated Riad in the middle of Rabat’s medina. You will share a room with at least one other volunteer. The Riad is conveniently located nearby the famous Rue des Consuls for its shopping. You will share your breakfast and dinner with fellow interns and volunteers prepared by the local cook. You will also be able to enjoy westernised bathroom and toilets and be a simple but comfortable accommodation. Rabat offers many hidden gems to explore during your time off. You will have the time discover its maze-like streets, beautiful hidden mosaic fountains. markets and food streets. Rabat also offers many points of interest like the Kasbah des Oudaias palace, Hassan Tower. We recommend that you take in the beauty of the old architecture and the craftsmanship that has gone into it. Rabat is also a great location to plan day trips or weekend trips to the Sahara Desert, Casablanca, Fes, Marrakech and many other local spots. Project activities: assist local professionals in daily tasks, propose activities and workshops, help with the feeding, etc. Accommodation: Shared bedroom in volunteer house. Option for a host family if you speak to your placement advisor. Police/Government Background Check; US and UK citizens will be processed through Kaya (admin fee applies) all other nationalities must provide local police check. Gain meaningful work experience in an area relevant to your studies or potential career choice and participate in a Healthcare Internship in China through Kaya.